In Tanzania the focus is on establishing the Information-Internet to provide healthcare services through mobile applications. GSMA has an infrastructure sharing pilot operation in Tanzania, thus an extension towards Information-Internet provision will allow for cost-effective provision of health services. The focal areas are enhancements of the epidemic registration, reporting and response through mobile apps, digital literacy programs, and entrepreneurial opportunities for indication-based diagnosis. The primary health centres will act as focal points for health education, to be extended with other education. 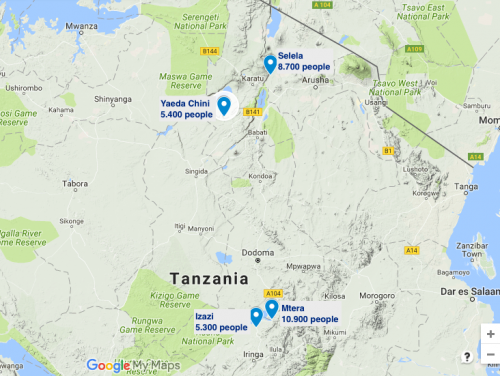 The overall objective of the health related activities in Tanzania are: To increase awareness on One Health to 80% of at risk population from identified priority zoonotic diseases areas at all levels, by June, 2020. Specifically, will be to produce the customized content for the health messages and to make a plan for rolling out the HIV, Tuberculosis, Antrax and One Health messages in Mtera, Izazi in Iringa district, and Selela village of Monduli district. We have established contacts with similar activities, worthwhile to mention is the project from Matogoro Jabhera, Assistant Lecturer & Coordinator - Microsoft Innovation Center, Tanzania at the College of Informatics and Virtual Education, The University of Dodoma (www.udom.ac.tz). Matogoro exploits TV White Space for Rural Broadband. He has also received funding from Internet Society to deploy a community network in three educational institution in Kondoa District in Dodoma Region. We will use TV White Space a Back-hauling technology to bring Internet Access tho these schools. The University of Dodoma procured White Space Radios from Carlson Wireless in USA and we are ready to officially launch this network early March, 2018.